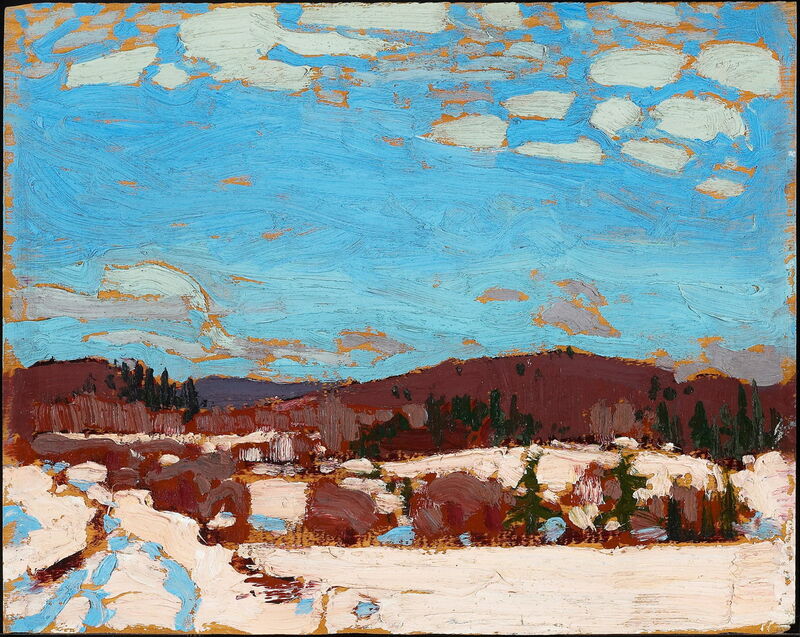 Tom Thomson’s studio work during the winter of 1916-17 was extensive, and resulted in two of his finest and most important paintings. One of Thomson’s early sketches had explored a motif of isolated trees set against a dusk sky: Pine Trees at Sunset (1915). From that, The Dead Pine (1916), and other plein air sketches, he painted two large works on canvas during the winter of 1916-17. Tom Thomson (1877–1917), The Jack Pine (1916-17), oil on canvas, 127.9 × 139.8 cm, National Gallery of Canada / Musée des beaux-arts du Canada, Ottawa, ON. Wikimedia Commons. 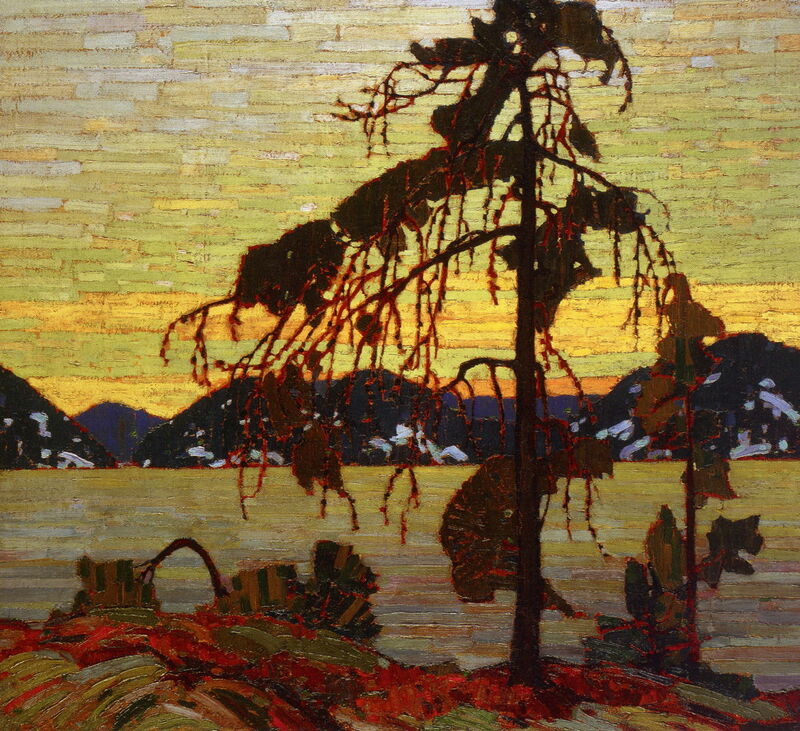 The Jack Pine (1916-17) developed considerably from another sketch which he made in Algonquin Park the previous year. Set at dusk, against a luminous sky formed from longer strokes of colour, Thomson has lit the straggling branches of the pine tree in red. The surface of the lake mirrors the sky in colour (the water being more muted) and in its facture. Remaining patches of snow on the distant shore break up the dark forms of the hills, and more red in the foreground adds to the sunset effect. 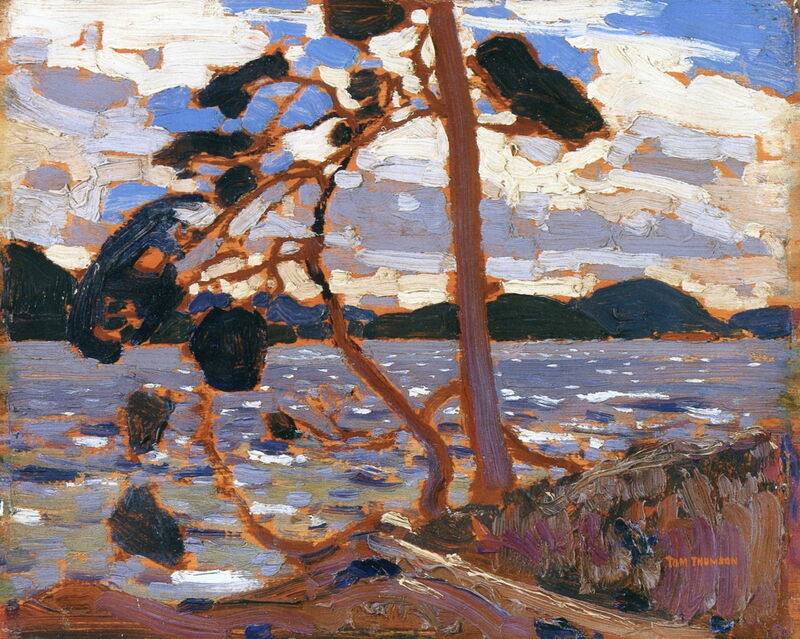 Tom Thomson (1877–1917), Sketch for The West Wind (1916), oil on wood, 21.4 x 26.8 cm, Art Gallery of Ontario, Toronto, ON. The Athenaeum. His other major masterpiece of that winter followed more closely this sketch which he had made for The West Wind (1916). Its pine is leaner, it lacks the dusk light, but the surface of the lake is here peppered with small breaking waves generated by the wind of its title. 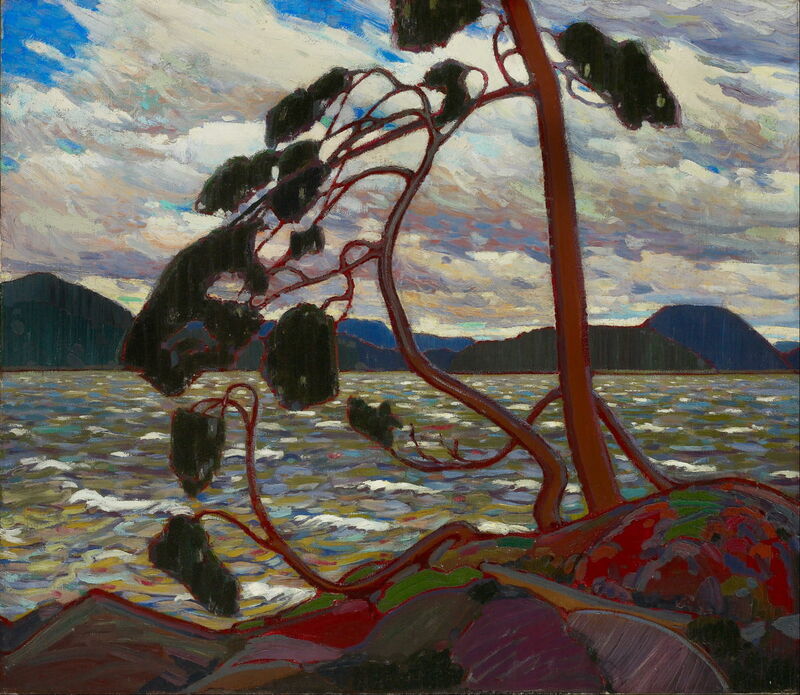 Over the winter, this evolved into Thomson’s famous large canvas of The West Wind (1916-17). The sinuous branches of the pine curve over the background of the lake’s rough water and clouds. Although set in full daylight, the range of colours in the clouds is broad, and they contrast with the even, dark hills formed from dense vertical strokes of paint. 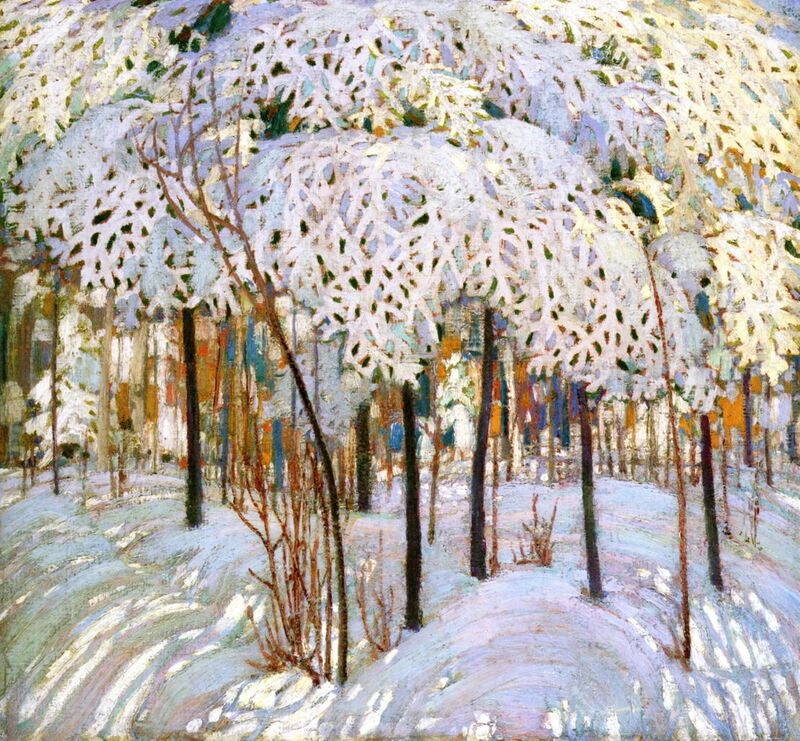 Snow in October (1916-17) is another well-known studio painting which Thomson made that winter. Its fine geometric reticulations of frozen white canopies are another surprise, and an opportunity for the artist to use subtle colour and patterns in its shadows. Tom Thomson (1877–1917), Northern Lights (1917), oil on plywood, 21.5 x 26.5 cm, Private collection. The Athenaeum. Thomson still seems to have painted outdoors occasionally during the winter. 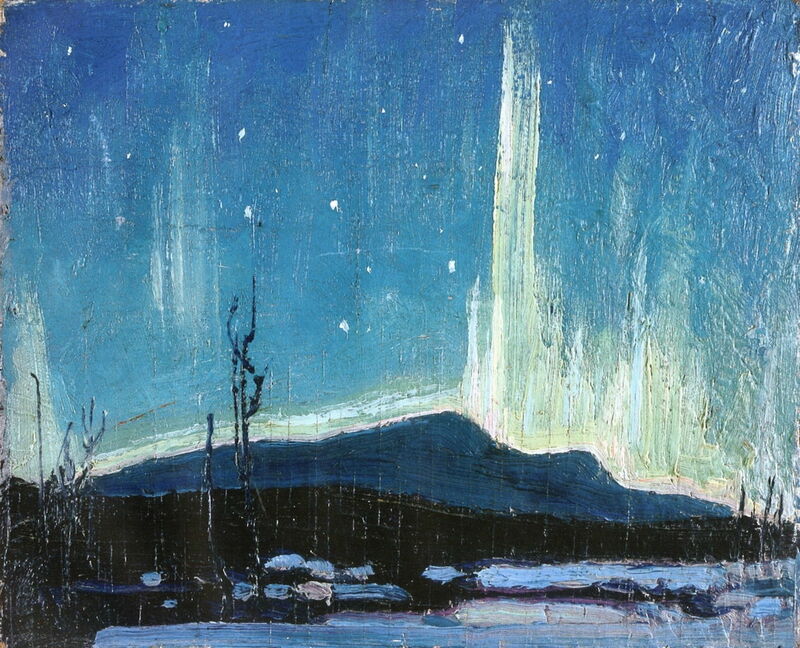 Northern Lights (1917) is one of five sketches which he made of the spectacular and transient Aurora Borealis, on this occasion with the ground still well-covered with snow. 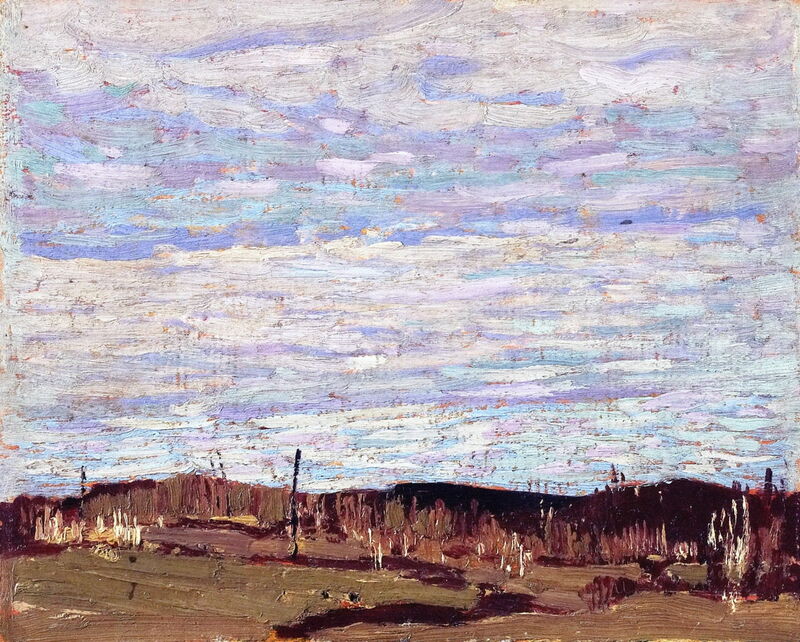 Tom Thomson (1877–1917), Early Spring (1917), oil on wood panel, 21.5 x 26.9 cm, Art Gallery of Ontario, Toronto, ON. Wikimedia Commons. 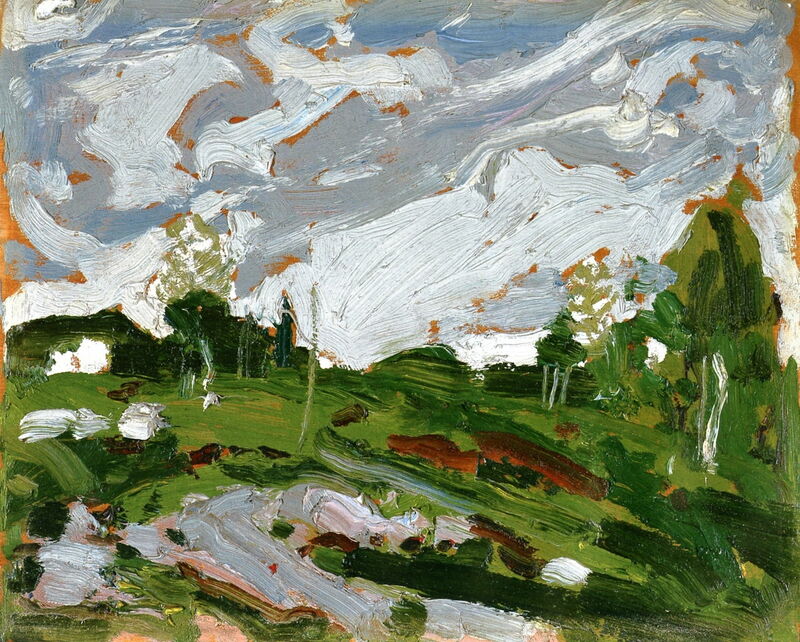 With the arrival of spring, Thomson lost no time in getting out of his studio to paint en plein air in early 1917. Early Spring (1917) is a very simple sketch which demonstrates the extent of the remaining snow cover when the artist resumed outdoor work. 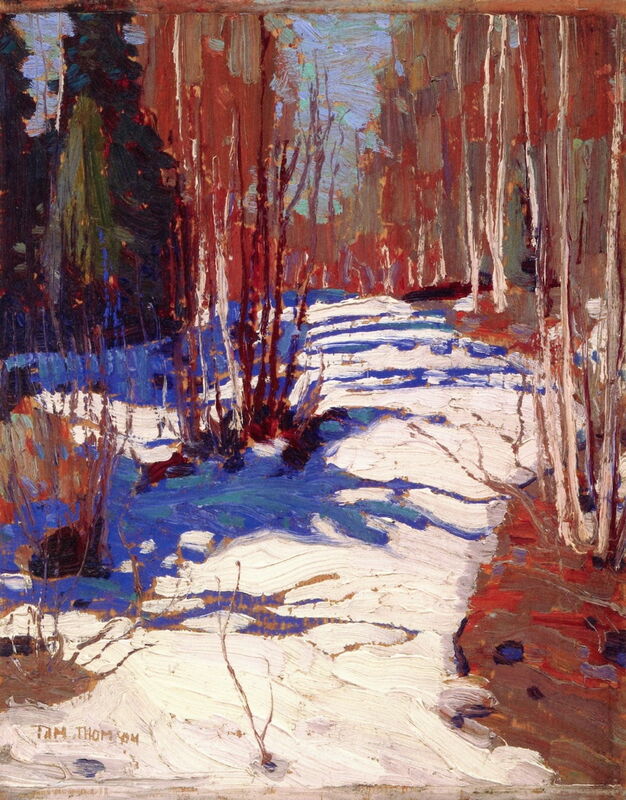 Tom Thomson (1877–1917), Path Behind Mowat Lodge (1917), oil on board, 26.8 x 21.4 cm, Private collection. The Athenaeum. Once again, Thomson based himself for much of the time at Mowat Lodge, in Algonquin Park. Path Behind Mowat Lodge (1917) shows one of the tracks leading away into the forest, still with extensive snow cover, in the Spring sunshine. 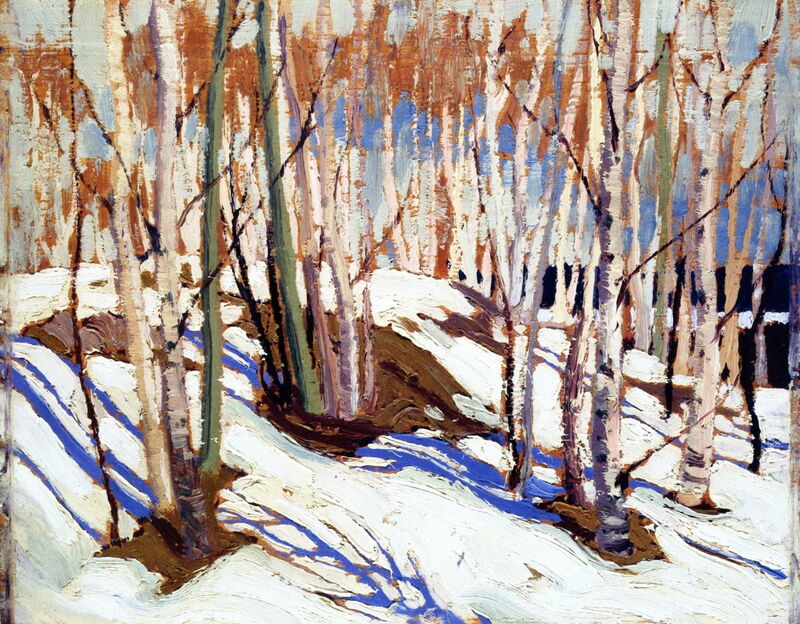 Early Spring, Canoe Lake (1917) is another oil sketch of young trees in the Spring snow. This again bears the marks at left and right demonstrating that it was painted while secured in his pochade box. Tom Thomson (1877–1917), Larry Dickson’s Cabin (1917), oil on wood, 21.3 x 26.6 cm, National Gallery of Canada / Musée des beaux-arts du Canada, Ottawa, ON. The Athenaeum. Larry Dickson’s Cabin (1917) is later into the Spring, and unusual for Thomson in that it includes two figures, albeit at some distance. At least one of those appears to be a woman, who is wearing a white hat and mid-blue coat. The hut of the title is directly beyond them, shielded by a row of trees from the water’s edge. 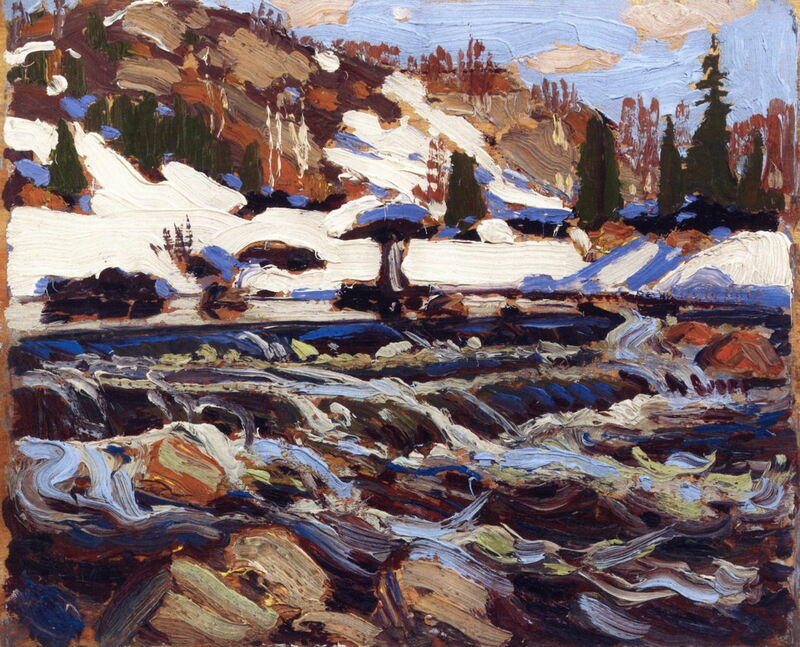 The Rapids (1917) is one of his finest oil sketches, and was selected by AY Jackson, who said that he could never paint a river the way that Thomson did. These rapids are formed from a range of different marks, reflecting not just his visual experience of them, but his knowledge of the water from his canoe. 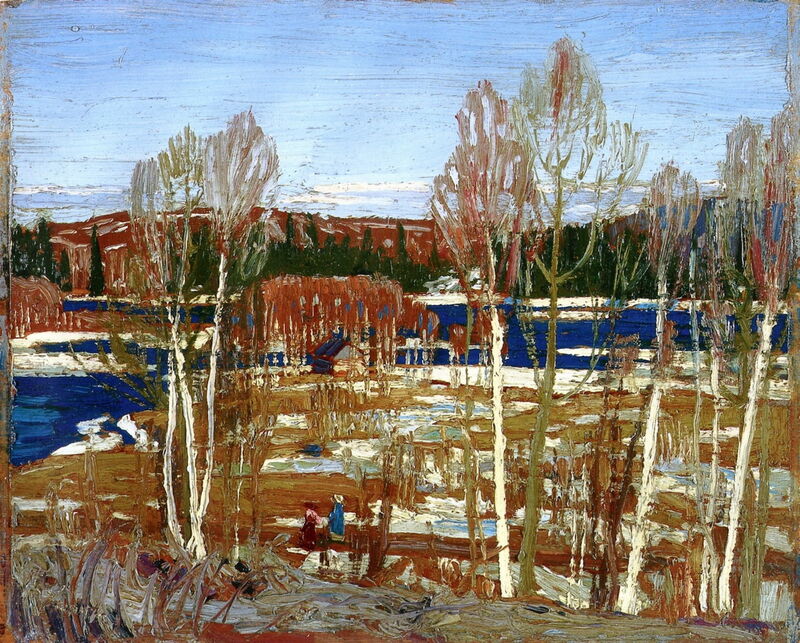 Tom Thomson (1877–1917), Spring (1917), oil on panel, 21.6 x 26.7 cm, Art Gallery of Ontario, Toronto, ON. The Athenaeum. At last, in Spring (1917) the snow has finally gone. This sketch seems similar in its intention to record the sky to those of a long artistic tradition, including John Constable’s ‘skying’. Tom Thomson (1877–1917), Tea Lake Dam (1917), oil on wood, 21.3 x 26.2 cm, McMichael Canadian Art Collection, Kleinburg, ON. The Athenaeum. Tea Lake Dam (1917) is a remarkably vigorous sketch of this part of Algonquin Park, and was thought to be Thomson’s intended destination when he went missing. 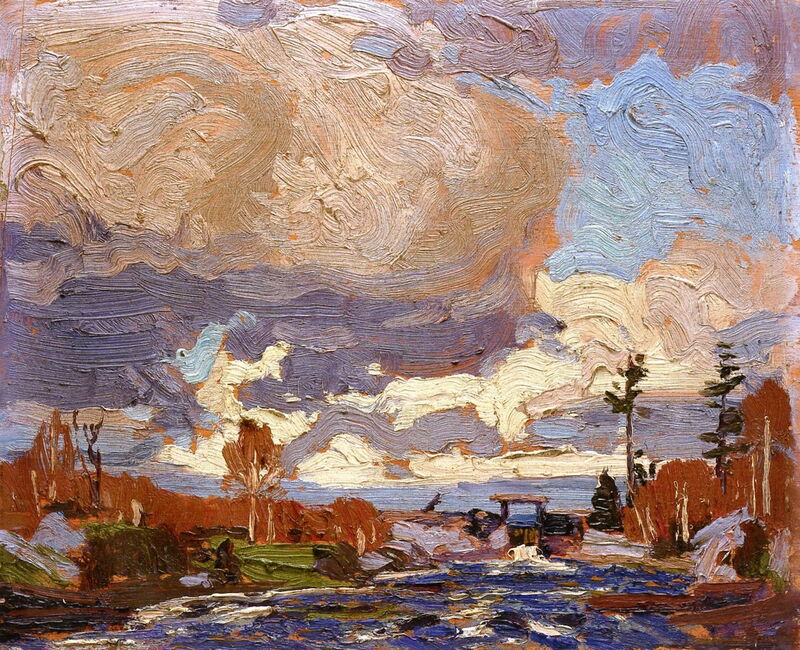 After the Storm (1917) was probably the last of Thomson’s paintings, sketched very quickly as the scud clouds moved away and the gusts of wind abated. Then, a century ago today, on 8 July 1917, Thomson disappeared. He was last seen by a Park Ranger, leaving Fraser’s Dock to paddle to Tea Lake Dam or West Lake, after 1230. His body was discovered eight days later, drowned in the lake which he had paddled in and had painted so often. He was just a month short of his fortieth birthday. There has inevitably been a succession of conspiracy theories which have been proposed to account for Thomson’s tragically early death. There are claims that he was killed in a fight, or that he committed suicide. At the time, there seemed little doubt that he had simply drowned while canoeing alone. Despite his great experience and practical skills, that is an ever-present risk, particularly for the solo canoeist in such isolated and challenging environments. His colleagues – Lawren Harris, Franklin Carmichael, Frank Johnston, Arthur Lismer, JEH MacDonald, Fred Varley, and AY Jackson – went on to form the Group of Seven in March 1920. Although Thomson didn’t live long enough to see that, he was a member in spirit. His paintings live on as a major influence and inspiration to landscape painters today, a century later.